With the beginning of Summer we also have the beginning of Row by Row Sew Musical. Now thru September 4, 2018 Row by Row is sharing harmonious tunes at many quilt shops across the United States and worldwide. Free pattern are available at each participating shop. Kits are availible as well, price is $7.99. New fabrics are arriving daily. The end of June we received the NEW 30 Grunge by Moda. Fabrics and notions are coming in fast and furious. Come shop today and see what the UPS and Fedex trucks have dropped off. All Christmas fabrics are 20% off during the remainder of July. We have an amazing selection of Christmas and winter fabrics. Come check it out today. 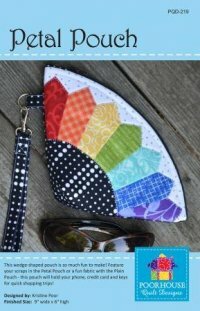 This class will create a wonderful wallhanging as you learn the techniques of raw edge applique. Choose a pattern by designer BJ Designs & Patterns and we will teach you the technique of Raw Edge Applique. Please decide on the pattern at least a week prior to the class so you have time to do the prep work for the class. Class fee is $15. 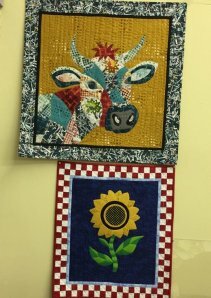 Sign up today on the website www.thequiltedsunflower.com or at the shop. We are starting the Bag Club back up. We will meet the 3rd Tuesday of each month. There will two opportunities, Daytime 1pm to 3pm or Evening 6pm to 8pm. July we will make the Petal Pouch. Sign up today on the website or come by the shop. THis is a two day class. July 25 from 1 to 5 and August 1 11 to 5. Class fee is $15. 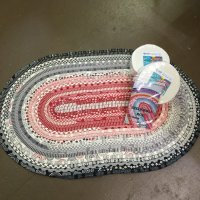 Join in on the fun making one of these Jelly Roll Rugs. Sign up on the website or come by the shop. Learn all about your treasured featherweight sewing machine. How to clean and maintain your machine so it will sew beautiful stitches for many more years. You will leave this class with strong knowledge of these fun vintage machines. Sign up on the website or come by the shop. Supply list is on the web or we can give you a list. Make 8 cards for $15, all supplies furnished. Cash or Check to Debbie the day of the class. See website for class info or call the shop. Every Friday is Free Sew Friday - Join the fun and sew as long as you like. Starts at 10am. Call and reserve your spot.